Are you ready? I mean REALLY ready? It's Saturday morning, and I'm so excited to share this freshly baked batch of Caturday goodness with you! In this brand spanking new edition, we'll get to know three super cool kitties by the names of Archie, Noel, and Hortense! Make sure you buckle up your cuteness seat belts, because it's going to be a bumpy ride! First up, Zara of The Little Food Critic writes in to tell us about this gorgeous little explosion of fluff known as Archie. Zara sez, "Hi, I just wanted to share with you two photos of one of my boyfriend's mother's cats (a bit of a mouthful), called Archie. Out of the four cats, Archie has the most personality, often described as a "stealing fluffy terrorist," as he has a habit of opening packets of croissants and taking a bite out of each one while nobody's watching. Unfortunately a few years ago he was knocked down, so now he has metal pins and plates in his leg. This hasn't hindered him in his stealing duties in the slightest. As you can see he is extremely fluffy and well worth a cuddle." Who wouldn't want to get in some cuddle time with this furry little (big) guy? Zara, you need to set up a hidden kitty spy cam to catch him in the act! And then upload it to YouTube, and send it to me, because I'm dying to see this cuddly croissant burglar in action! Next up, Jen and Brett sent it pictures of their two sweet girls, Noel and Hortense. Jen writes, "The first two pictures are of our first baby, Noel. We got her when she was 2 years old in September 2009 from the Idaho Humane Society. We're not sure if she had a traumatic home life before coming to us, but she was (and sometimes still is) a very anxious kitty. She had some litter box problems the first few months she lived here and did not like having company over. She still prefers to not be picked up, and doesn't like to be petted all that often either but she has made a good adjustment and knows that she is safe with us. She does what we call "the flop" whenever one of us comes home from work where she will throw herself on the floor exposing her belly as if to say "hi!" She also gets rather chatty when she wants to go outside and watch the birds or chase bugs." Nothing gets me quite like "the flop!" Noel is so lucky to have found such an amazing home that is safe, and supportive of her needs! 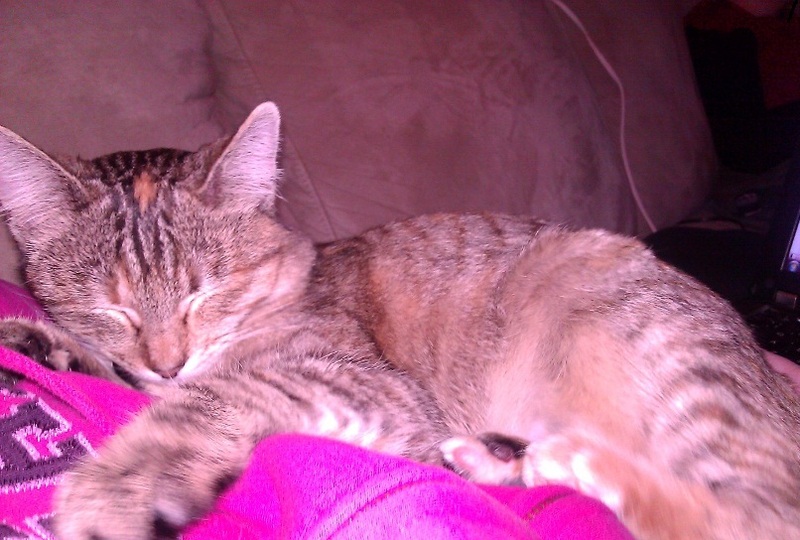 Jen also fills us in on the baby of the family, an equally beautiful little tabby named Hortense. She says, "The next two pictures are of our newest addition, Hortense. She will be one next month- we got her from IHS in October of 2010. She is extremely playful and will turn anything into a game. She loves to be petted, cuddled, and held, and can be heard purring from a mile away. She is always getting into trouble and making us laugh. She has been a good influence on Noel, helping her to become more secure and social. They love to cuddle and groom each other, and play fight of course! They bring so much joy to our lives, I can't imagine life without them." Well, excuse me, but I just went into the corner and died of cuteness! It's fabulous to hear these two "sisfurs" get along so well, and that Hortense is really bringing Noel out of her shell! I wish much continued happiness and love to this purrfect kitty family! Sleepytime Hortense. I love the little orange spot on her head! Big thanks goes out to Zara, Jen, and Brett for sharing their pictures and sweet kitty tales with us this week! Every cat has a unique story, and one of my favorite parts about running this blog is getting to know my readers and their awesome cats! Want to see your cat(s) on Catsparella? I'm now taking submissions for my weekly Caturday post! Just email your best kitty pics to catsparella@gmail.com, and include the cat's name and anything else you'd like to add. I can't wait to hear from you! Such beautiful ones fur sure! Yep, I'm ready for Saturday!!! fallen on the floor thoroughly overcome with the paws!! Oh who cute are all of them?! Archie is sooo Fluffy! "The Boys" and I are glad we stopped by because we got to meet such cuties. Hortense sort of reminds us of our Scooter...from many years ago. And Zara almost looks like a bit powder puff or marshmallow. They are all great looking kitties! I like meeting new friends. these kitties are gorgeous! Love Archie's floof! This certainly wasn't a "bumpy ride!" OMD, Archie is gorgeous! And we think tabbies are very special. Noel and Hortense look like total sweeties!! The stealing fluffy terrorist! haha! I'd share a croissant with Archie! Noel and Hortense are adorable!